If you are ever unfortunate enough to crash your car in the vicinity of Gothenburg in Sweden, you might find Jan Ivarsson and his team descending on the scene with the unseemly enthusiasm of a whiplash claims lawyer. 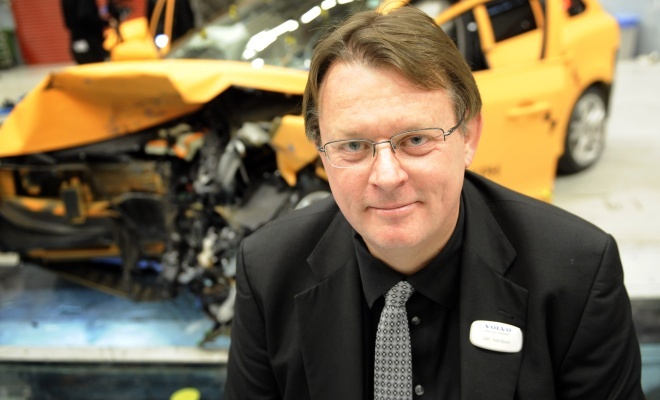 Ivarsson is Volvo’s safety manager, responsible for ensuring Volvo cars remain among the safest on the road. 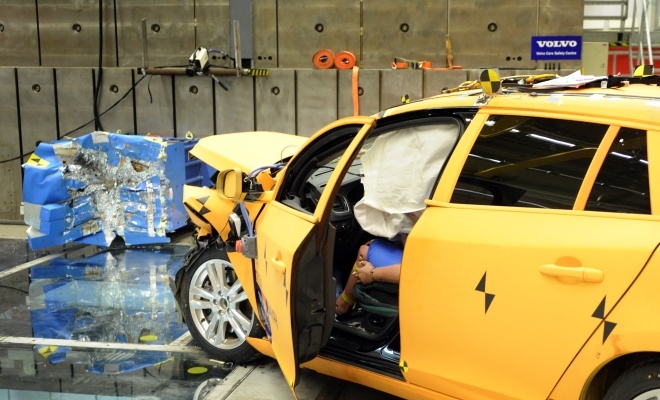 He is also one of the many employees charged with delivering the company’s ambitious goal of zero injuries in new Volvos by 2020. Hence his interest in your unfortunate mistakes behind the wheel. While it’s possible to simulate all sorts of impacts using computers, there’s no substitute for the real thing. People behave in unpredictable ways, and our roads are not lined with uniform concrete walls. Every real accident is a unique learning opportunity. Of course the remaining way to study impacts is to create some of your own, by flinging cars about under controlled conditions. Which is how I find myself standing on glass, next to a 600-tonne concrete block armoured with thick steel plates, in a cavernous chamber at the end of a long, arrow-straight tunnel. Behind me, bolted firmly to the house-sized block, is the squashed remains of an aluminium-honeycomb deformable barrier. And just ahead of me, slewed sideways, is a brand-new Volvo V60 Plug-in Hybrid Electric Vehicle, sprayed matte orange and now looking a little secondhand. Where its left front wing used to be there is now an ugly piece of sheet-steel origami. Car and barrier have just embraced each other at 64km/h, or about 40mph. The damage is extensive, but of course that’s all to plan. The parts that have squashed and crumpled are designed to sacrifice themselves to protect the passenger cell, which is full of flaccid airbags and crash-test dummies but appears undamaged. The driver’s door still swings open on its hinges as if nothing is amiss. Today’s test is part of the process of ensuring the new Volvo V60 PHEV copes as planned when things go wrong. The car’s basic structure is already well tested, but the new diesel-hybrid powertrain brings fresh challenges, not least from the dangerous, 400 volts of energy bottled up in the big battery in the boot. The smashed front wing of today’s test car bears the V60’s charging socket, mounted well back towards the doorpost but still obviously in the crumple zone at 40mph. 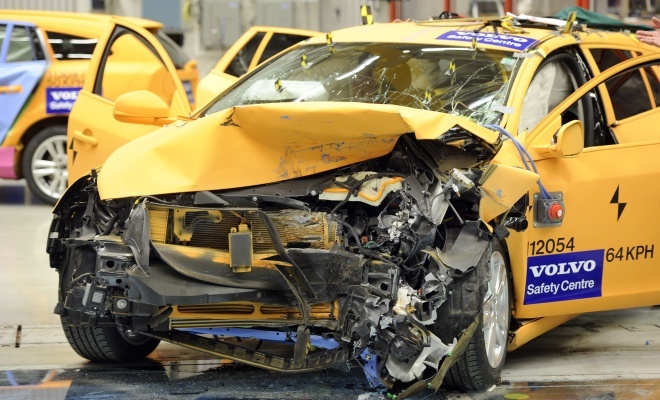 According to Ivarsson there are multiple independent crash detection systems designed to isolate the electrical systems in an instant, rendering the car safe for the emergency services. As was unfortunately proven by Chevrolet recently, the energy held in an EV’s battery can remain dangerous for quite a while – a Volt electric car burst into flames three weeks after a side-impact test had evidently ruptured its battery pack. Investigations are still under way, but it seems likely the fire was caused by an electrical short-circuit, brought about by the battery’s coolant dribbling away and drying out, leaving behind conductive crystalline deposits. I ask what kind of collision would overwhelm these safety measures but don’t get a straight answer. “It’s not possible to make it indestructible,” is all I’m told. No doubt Ivarsson knows exactly how big an impact will breach the battery, because his crash-test laboratory is an impressive and very flexible facility. A hawser and pulley arrangement set into the floor of the tunnel is capable of flinging cars into the barrier at up to 120km/h (75mph). 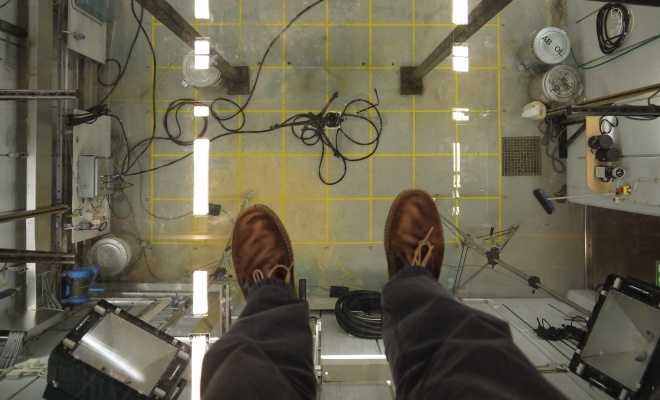 The transparent section of floor is an 11cm-thick sandwich surfaced with sheets of bulletproof Lexan. It’s an unnerving floor to walk on as it’s completely clear and there’s a big open space stretching at least 30 feet below, where lights and cameras stare upwards from their tripods, poised to capture the underside of collisions with high-definition precision. Similar cameras hang from steel gantries overhead. And while the 600-tonne block looks as immovable as a mountain, it is actually a very heavy hovercraft. Climb aboard via the galvanised staircase and you can power it up and shift it aside on a cushion of air. When it floats across the polished floor it leaves a wide open space, suitable for side- and rear-impact testing. Weighted trolleys with deformable noses stand on racks at the walls, ready to be forklifted down and slammed into stationary cars. But the more startling reason for removing the barrier is to bring a second acceleration corridor into play. Like the big barrier block, the entire secondary tunnel is mounted on air cushions, and can be swung through 90 degrees to let the lab study a wide range of angled collisions. The second tunnel can run at up to 80km/h (50mph), meaning the lab can hurl real cars at each other at closing speeds of 200km/h – or 125mph. Even a Volvo will struggle to safely channel that kind of impact energy. We are already seeing these measures roll out onto our roads. The entire V60 and S60 range comes fitted with a City Safety system as standard, for example. At urban speeds up to about 20mph, it uses an invisible laser to scan the road ahead and will deploy the anchors at the last moment to avoid a collision if the driver fails to react. We’ll see lots more innovation in this area before 2020. 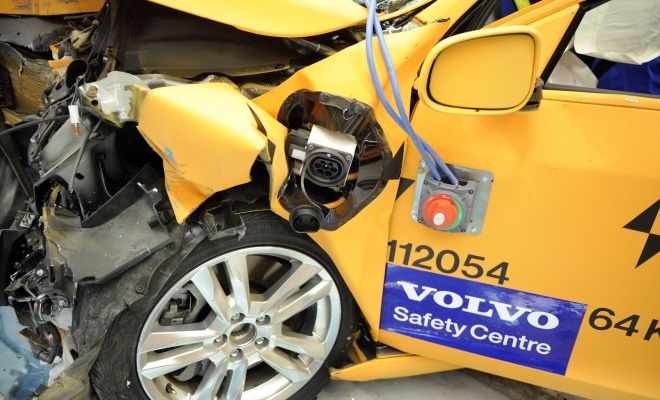 I hope Volvo succeeds in its admirable aim of eliminating injuries. I’m sure Ivarsson looks forward to a time when he no longer has the option to dash out and study yet another real-life wreck.